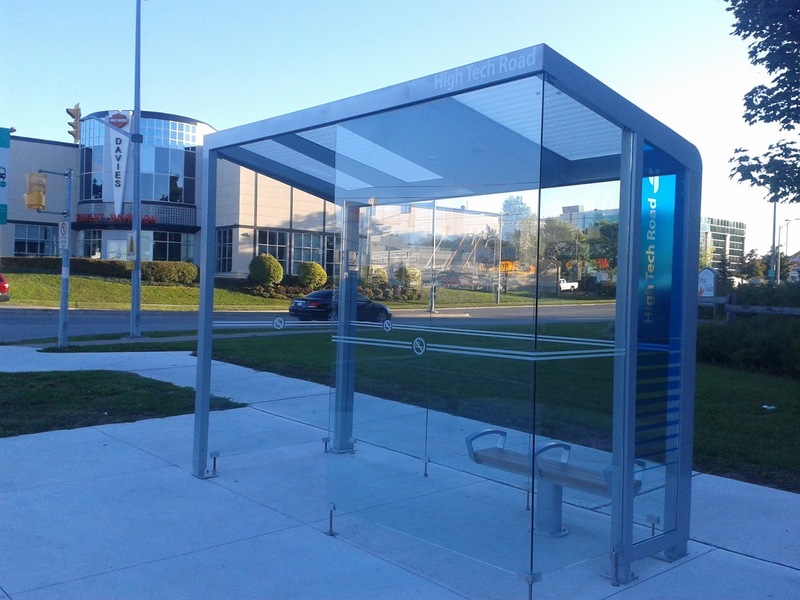 Recently YRT has been investigating standardizing the street furniture at all of their bus stops. 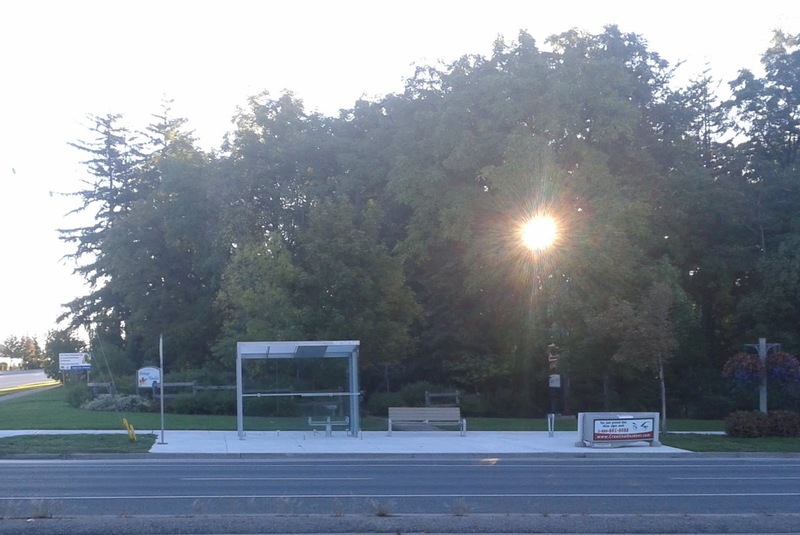 This morning I visited Bus stop # 2351 at the southeast corner of Yonge Street & High Tech Road to take a gander. Overall the bus stop looks modern and nicely designed. The overall look looks pretty consistant throughout each of the aspects with the utilization of stainless steel, aluminum and wood throughout. Hopefully these design features can be used to refresh the still newish looking Viva Stations that were poorly designed and thought out when built and implemented (i.e. winter uses of VIVA stations with stainless steel benches and shelters designed so the wind blows through them). But to truly appreciate the design and practicality, each one of the components needs to be individually investigated. The most important item at a bus stop, besides the bus stop sign, is the bus shelter (transit shelter) itself. Properly constructed shelters ensure the passengers waiting for the bus are kept dry during rainy weather and out of the cold winds during the winter season. Added benches inside the shelter add further comfort as some passengers are not able to stand for long periods of time. 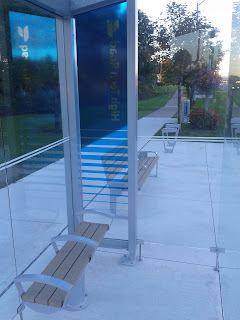 The shelter at Yonge Street & High Tech Road optically looks similar to other YRT shelters with tempered glass being held up by supports screwed into the concrete. But there is a difference with better YRT branding and cross street names on the side of the shelter embedded into the glass as well as across the top face of the shelter. Thus, shelter wise, the only difference really between the old and the new shelter is the added name and a few improved signage placement for the YRT logo. Design wise the shelter is missing a few design components that for whatever reason never made it to the installation stage. On page 2 of this presentation it shows the design concepts for the shelter as presented to the public, Region of York Council and in the Request for Proposal. The first noticeable design component absence is the advertising panel on the shelter. This was probably left out because normally these components are provided by the advertising agency who looks after the Region's bus shelter. In this case CBS, who holds the Richmond Hill contract, could have been invited to be included in this design testing phase but obviously was not. There is no indication as to why the current advertising supplier was not included in this pilot project. The second design component missing is the YRT bus map. Many will point out the the Yonge & High Tech bus stop is a local stop and not very busy compared to the VIVA stations and the downtown Richmond Hill locations like stop #4694 in front of the McConaghy Seniors Centre. However, the design literature provided by YRT to council and the public clearly shows that a location for a map is clearly delinated. As well in comparison, OC Transpo in Ottawa provides system maps at all of their local bus stops that have shelters that probably see less service than the stop located at High Tech Road & Yonge in YRT's territory. Thus, as a prototype bus shelter it is weird this important design component is missing in physical presence at the pilot project location. The third design component missing is the "Flexible base trim to allow for field adjustment of grades". The design concept appears to be designed to ensure the shelter looks good estically instead of having the glass supports drilled into the ground visible. As well, in practicality, it closes in the shelter from having the snow and wind blow in on the cold days at passengers. YRT learned this lesson at Richmond Hill Centre when, in 2006, they boxed in the waiting areas at Richmond Hill Centre in an attempt to make the passenger waiting area more viable. But surprisingly at the protype stop at High Tech Road & Yonge Street, this was left out and the glass supports are clearly visible. Inside the shelter the benches are significant improvement compared to the current YRT recycled plastic benches and the VIVA angled stainless steel benches. The prototype benches are flat easy to sit on, yet have stainless steel rails to prevent homeless and others from bunking up on them. The seats themselves appear to be made of wood which leaves a question of how resistant they are to etching by vandals wishing to leave their mark that they were there in 2012. The outdoor benches are larger than their interior counterparts but retain much the same design concepts but has a back to rest on. These benches are a great improvement over the mostly municipal supplied ones that have seen better days at the current local bus stops like VIVA Station # 9803 at Yonge & Wellington Southbound in Aurora. But at 7 feet 3 inches wide, it will be interesting to see how or if YRT will be shoehorning these into stops like VIVA Station # 9786 on Yonge Street at Crosby Avenue Southbound. Perhaps they will go with the smaller 3 foot 10 inch smaller bench option in this case. This will hopefully resolve the scatterbrained concept of some YRT's stops, like the Crosby Avenue stop noted above, that contain a mish mash of older shelters, benches and other items scattered about causing passengers to be careful walking on the sidewalk. One design flaw that I noticed, but doesn't appear on page 14 of this presentation provided by YRT, is the middle bench arm doesn't fully extend to the front of the bench itself. In the physical prototype at High Tech Road & Yonge Street the arm is present but on the front of the bench the arm is installed aproximatly six inches in from the front edge. 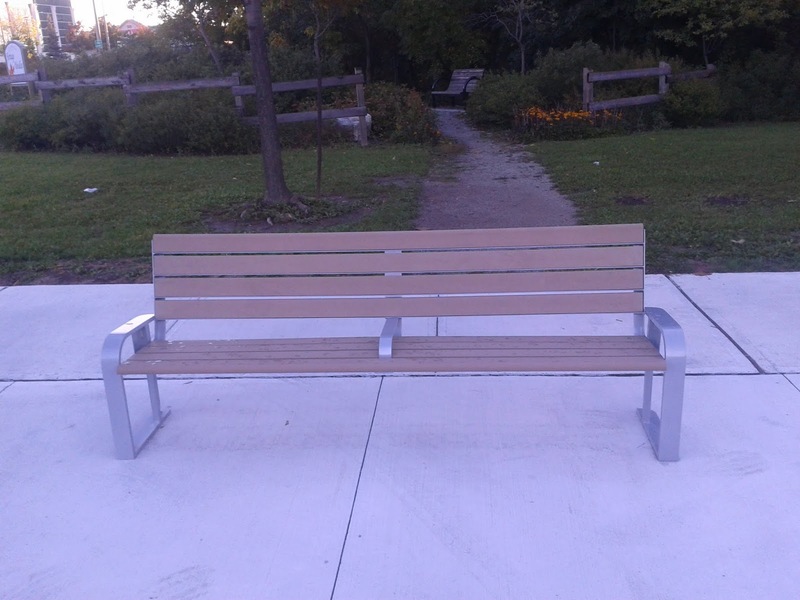 This provides opportunities for skateboarders to easily "grind" on the front of the bench. The current location of the bus stop on a newly poured wide concrete sidewalk area provides an open inventation to skateboarders for this type of activity. Added to this issue the wood finish of the bench does look pretty inviting to a vandal looking to leave his/her mark that they love someone at a certain point in time. So these benches as they physically stand now, need updating so that, at minimum the arms do come out to full front to prevent the grinding by skateboarders. As for the vandalism issues, hopefully the prototype stops will show in a years time if this issue needs to be addressed through re-engineering. The prototype stop at Yonge Street & High Tech Road, didn't have the new garbage/recycling recepticals on hand. Only the old existing recepticals, pictured above, were present. Hopefully the new containers are better manufactured compared to the older ones that have issues. The older recepticals, like the model pictured above, mean a tall person has to lean over and fire their items into the lower slung ones. The cleanliness of these recepticals, apart from having the materials removed, has been suspect for quite sometime. As an example, the current garbage/recycling container at VIVA Station #9779 at the Northbound 16th Avenue/Carrville Road and Yonge Street looks revolting and probably hasn't been powerwashed since it's installation. The 16th-Carrville container also seems to be leaking whatever liquid contents it possesses onto the sidewalk below causing discoloration of the sidewalk. So hopefully the new maintenance contract for these will include power washing at least on a yearly basis of each garbage container. Perhaps having them all powerwashed by mid July might be an option in an attempt to cut down on the number of Yellow Jacket Wasps that seem to call these containers home during the summer months. The newstand, or location for publications, has been moved from the typical layout of being incorporated with the garbage cans. Interestingly enough at the High Tech Road & Yonge Street prototype location, the newstand is more on the sidewalk seperated from the bus stop concrete platform instead of included. Optically this looks a little weird that the YRT would locate more closer to the sidewalk away from the bus stop even though at this location the bus stop layout is not squeezed for space. Besides location issues, the "Newstand" graphics printed directly on a vinyl sticker and applied aluminum publication stand is probably going to be a target for vandalism. These stickers, like their Presto zone stickers at many current VIVA Stations are being defaced or peeled right off. Thus YRT or their contractor are going to be replacing these stickers probably on a monthly basis to ensure they look fresh and clean. Quizically, YRT didn't present an opportunity for the "multi publication" structure to be shown. But these are probably meant more for the more high traffic areas like Finch Station and Newmarket Terminal where space is and publication box clutter is more likely to occur. 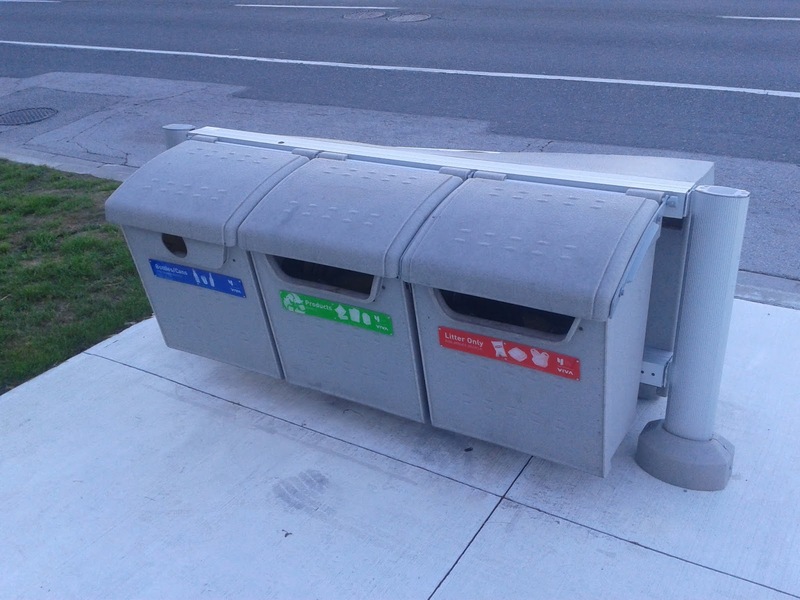 Originally when I reviewed the prototype at Stop #2351, I thought the above structure appeared to be the base for a later installation of the garbage/recycling containers. 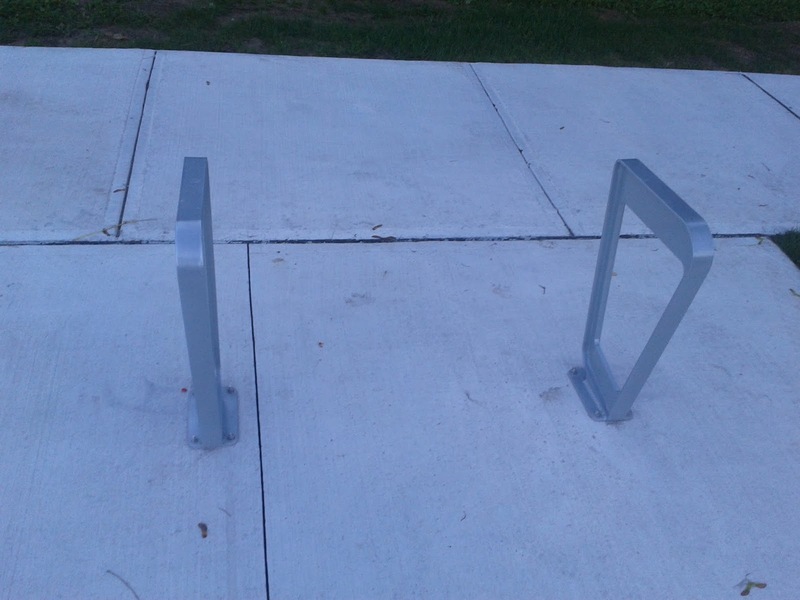 But upon further review of the design specifications for the bike racks (starting on page 1 of this YRT presentation), these were actually the bike racks. 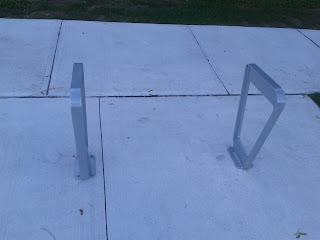 It will be interesting to see how many people actually use these structures as bike racks as opposed to tripping over them while they are stuck in the concrete sidewalk. Hopefully these will be used more than their current counterparts located at select VIVA Stations. 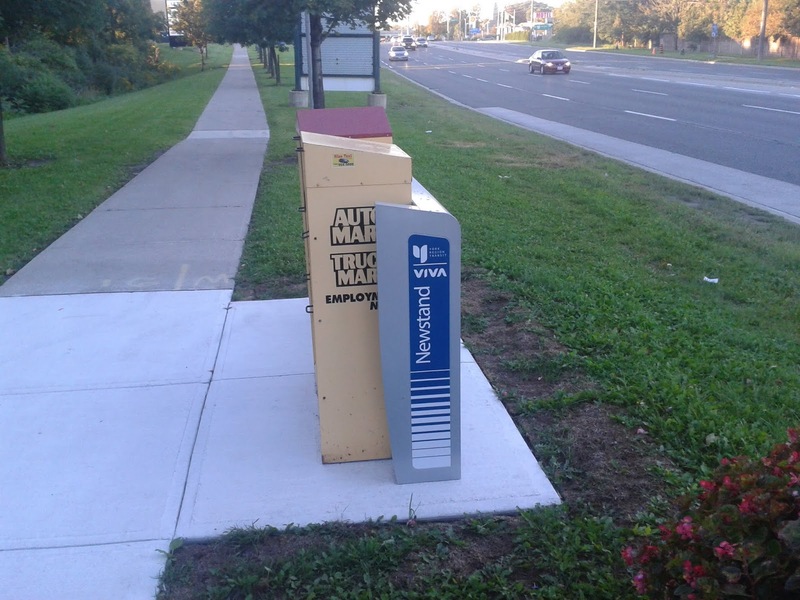 Overall the designs presented for the new YRT Street furniture to be located at bus stops are significant improvement. But they seem to differ in some cases from the physical prototypes constructed and installed at select locations across the region especially in terms of the shelters and the benches. Hopefully these defiencies will be noted and re-engineered before YRT moves forward with the roll out of these at bus stops across the region. 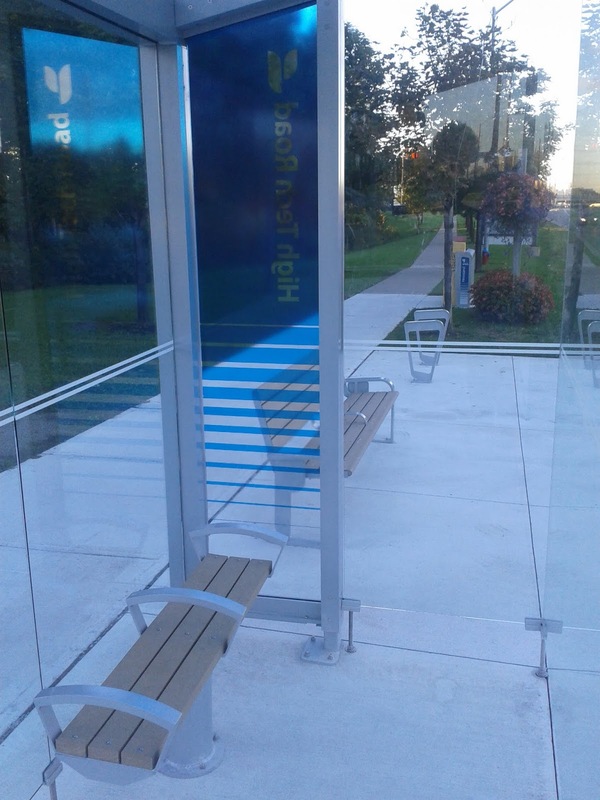 YRT passengers though will have to put up with the current mish mash of street furniture that dates from the era of municipal and GO Transit designs. Passengers will have to be optimistic that after YRT's field testing of the new street furniture, the flaws will be identified and fine tuned before it gets rolled out. YRT though does have history of rushing things out that are poorly designed and tend to punish passengers for taking transit rather than enhancing the experience. Proof? Try experiencing a VIVA shelter on a cold winter morning in February. Note: For more photos of the YRT Bus Stop 2351 at Yonge & High Tech Road, visit the Richmond Hill section of my photos.